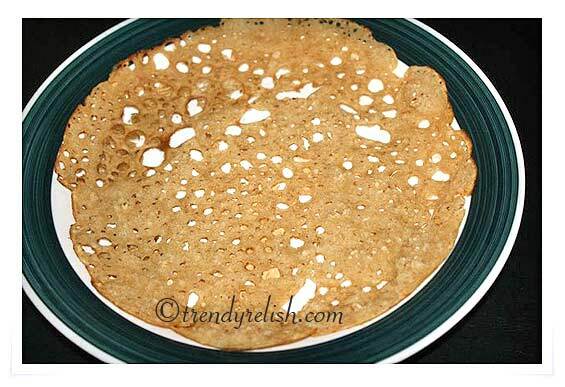 This is a very simple, yummy and instant dosa variety with brown rice. I previously posted 4 other versions of brown rice dosas. These dosa recipes can be found at the following links. Dry roast brown rice in a pan until it turns golden brown in color. Keep aside for some time until it becomes little cold. Then add this rice to a blender and grind into a fine powder (a little coarse texture is OK). Mix powdered brown rice with wheat flour + cumin seeds. Add salt and some water and mix well to make a smooth batter. The batter should be thin so that it can be poured easily on the pan. Heat a non-stick pan and pour a ladleful of dosa batter along the edge in a circular fashion. Then quickly fill in the circle with some more batter to make a big circular dosa. Pour oil around the dosa if desired and allow it to cook for some time. Loosen the edges of dosa with a spatula and flip the dosa to allow cooking on the other side. When dosa is done, remove it from the pan and place on a serving plate. Repeat the same process for as many dosas as you want. 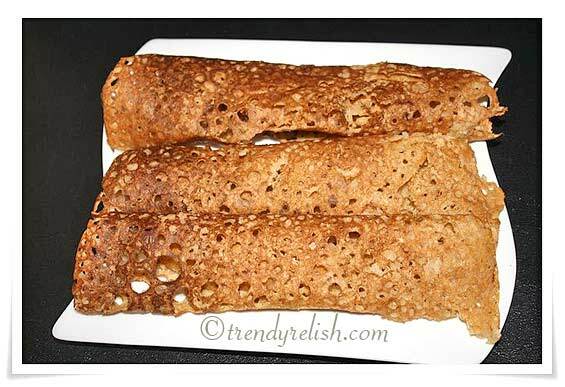 Enjoy these healthy and yummy dosas with desired chutney. Keep in mind that any dosas taste so better when hot. wow, that looks so tempting, love such easy dosas. looks awesome. so healthy and tasty. What a healthy Combo Dosa.Wonderful recipe.Will try it soon. Wonderfully prepared dosa dear. Lovely clicks. Never used brown rice in my cooking. must try sometime. Dosa looks great, love the texture! sounds healthy n lipsmacking Uma..
love to see you in my space too.. Sounds very healthy and yummy!